SHERRY HARRIS: Thanks, Reds for having me back! I can’t believe I’m here to talk about my sixth novel in the Sarah Winston Garage Sale mysteries, The Gun Also Rises. When my editor at Kensington and I were talking about the sixth book I knew I wanted Sarah to organize a book sale for someone. A book sale full of mysteries. My editor thought adding a Hemingway-like character with a missing rare book would be interesting. I read a lot of Hemingway during my high school and college days. And I will never forget an enlightening discussion with a professor about the symbolism in Hemingway’s short story “A Clean Well-Lighted Place” when I did an independent study. But that was a long time ago. In preparation for writing The Gun Also Rises I started reading more about Hemingway and came across a fascinating story some of you may be familiar with—especially if you’ve read The Moveable Feast—but I had never heard. Here’s the short version: in 1922 Hadley Hemingway was traveling from Paris to Lausanne, Switzerland to meet Ernest. She packed up his works in progress including the carbon copies. I sat there stunned. Could anything be more perfect? But how could I use it? Should I use it? Back to my editor for permission to change from a Hemingway-like character to using the event from Hemingway’s life. He was as interested as I was in the story and told me to go for it. 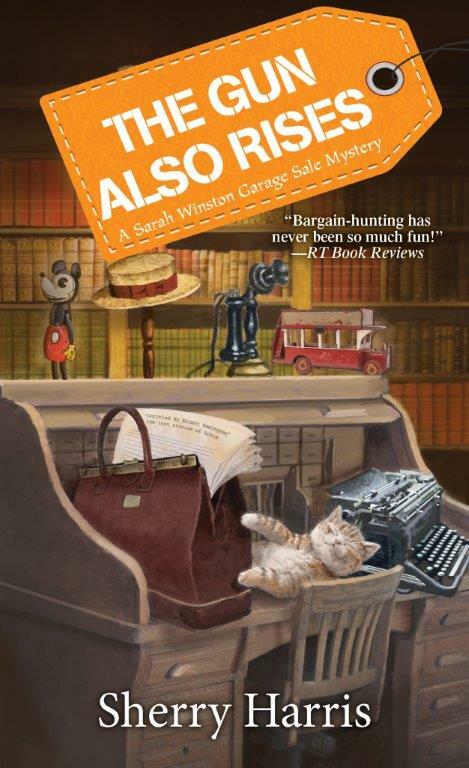 I decided that Sarah would find the missing bag with the manuscripts in her client’s attic tucked in with all of the mystery books. She takes them down to her client who is stunned that they are in her house. She asks Sarah to give her some time to process the find so Sarah goes back to the attic to work. When Sarah returns, she finds her client injured and that the maid has stolen the manuscripts. During Sarah’s search for the manuscripts she runs into a suspicious rare book dealer and a fanatical group called The League of Literary Treasure Hunters. They are convinced Sarah knows where the missing manuscripts are and follow her all over town. The story still intrigues me. At the time Hemingway was a well-known war correspondent, but he wasn’t the famous author he is today. I keep picturing someone thinking, “There’s a nice bag.” They steal it and dump all the manuscripts in the nearest trash bin. Who knows? Maybe they did Ernest a favor with all the rewriting he had to do. Readers: Are you familiar with the Hadley story? Any guesses as to what really happened to those manuscripts? I will give away a copy of The Gun Also Rises to someone who leaves a comment. 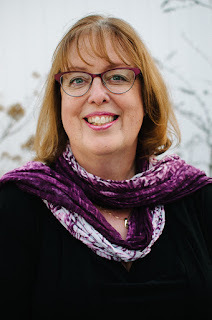 Sherry Harris is the Agatha Award nominated author of the Sarah Winston Garage Sale mystery series and the upcoming Chloe Jackson Redneck Riviera mystery series. She is the President of Sisters in Crime, a member of the Chesapeake Chapter of Sisters in Crime, the New England Chapter of Sisters in Crime, Mystery Writers of America, and International Thriller Writers. In her spare time Sherry loves reading and is a patent holding inventor. Sherry, her husband, and guard dog Lily are living in northern Virginia until they figure out where they want to move to next. Congratulations on your new book, Sherry. The missing Hemingway manuscripts have always been an intriguing mystery and I’m looking forward to reading your book. It certainly would be interesting to know what happened to the manuscripts, wouldn’t it? Since they’ve never surfaced, I suppose it seems sadly logical that the thief never realized their value and threw them in the trash bin, but the thought of them actually turning up somewhere is quite thrilling . . . . I agree, Joan! What a find that would be! I am not familiar with the Hadley story, but it sounds fascinating. Congrats on the new book. I'm looking forward to reading Sarah's latest adventure! Thank you, Marla. It's Hadley's story is intriguing! I wasn't familiar with this story until you talked about it being the basis of the mystery here. I'm curious to see what you do with it. I hope you like it, Mark! I had never heard about the stolen stories. They were really never found? I wonder if they really are in someone's attic! I really do enjoy this series. The typewriter on the cover of the new book looks like the one my dad gave me many years ago. I always envisioned writing my books on it. Unfortunately I no longer have that one but have been looking for a replacement. There is nothing better than the sound of a typewriter! Never found! I love the cover of this book and the typewriter! Ooh, I knew about the Hemingway tie-in, Sherry, but I don't think I'd heard the details of the real story! How fun. I can't wait to read the book. I'm so proud to be your blogmate. It was a bitter, twisted rival correspondent, who used to get drunk with Hemingway and who realized that his flamboyant colleague was way ahead of him in the writing of fiction--so he took a chance when Hadley left that satchel unguarded. Instead of destroying the pages, he tried to emulate the writing style, but the words twisted and turned on his pages and drove him mad. He ended up in a sanatorium where the nurses humored him when he said he had a satchel full of Hemingway's work.... Wow! That story really gets the mind to working, Sherry! CAn't wait to read this latest! Oh, I love your version! You need to write that story! I had no idea at all about Hemingway's missing manuscript. Finding the pages is a perfect premise for your book. Congratulations! Thank you, Judi! It's a fascinating tale! Sherry, I read about the manuscript disappearance in The Paris Wife, by (fellow Ohioan) Paula McLain. How much conflict must that incident have brought into the already troubled Hemingway first marriage? He was a man of great passion, and I'm sure it was the beginning of the end for them, or one of the final nails in the coffin of their marriage, at least. Poor Sarah, the trouble she gets into! Sounds like a fun premise to work with. Hearing how choked up Hadley was years after the event was amazing! This story is what Paula McClain's book THE PARIS WIFE is based on. It's a terrific read. and poor Hadley's misfortune is a brilliant bit to use in fiction. You're in great company Sherry. Can't wait to read this! I've been meaning to read The Paris Wife. I'll have to move it up on my list! The week after I read it a friend and I watched Midnight in Paris. Many of the same characters! It was fascinating to see them come to life in the movie. The Paris Wife is a fantastic read which led me to continue reading all of Paula McClain's books. A fascinating look at Hemmingway from different points of view: that of his wives. I had the pleasure of reading an arc of THE GUN ALSO RISES and loved your use of the historical mystery in your book, Sherry! I'm glad you liked it, Kim! After reading all of your comments, I would really love to read these books. I am especially interested in the ones that Kim Davis mentioned. Can anyone tell me if I should read these books in any particular order? I had heard about the missing manuscript. Great hook for a whodunnit. Welcome back to Jungle Reds! This story is new to me. I think Hadley was also the grandmother of Mariel Hemingway? I started reading the Paris Wife and did not finish it before it was due back at the library. Your new mystery novel sounds like a book that I want to read. I have The Sun Also Rises on my unread shelf! That sounds like a mystery. Did the thief steal the baggage, thinking there were jewels and fur coats, then got a surprise to find papers instead? In those days, would a thief go for manuscripts or jewels? What surprises me is that Hadley left her baggage instead of watching them. Thank you, Diana! I'm surprised she let the bag too! Why did Hadley leave the bag? I do remember hearing this story in college in my 20th Century American Lit class. At the time, I didn't really think about what could have happened to the manuscripts. Now...well, I guess as they've never been found the sky is the limit, right? I think now that we our writers the story is more meaningful! I remember hearing that there were missing manuscripts, but I never knew how they came to be missing.Since they’ve never shown up, my guess is that they were destroyed. I can’t wait to read your book, Sherry! Thank you! It's fascinating to thing about! it's been so long since I read A Moveable Feast that I don't remember any of it. Sorry Ernest! I think someone saw an opportun ity abd took it and the bag. And no doubt tossed everything in the trash that was of no interest. I love real-life historical mysteries like the story of the missing Hemingway mss. I've been listening to a wonderful podcast, THE HISTORY OF ROME, that goes from pre-history to the deposition of the last Roman emperor in 476. There was an anecdote that really caught my imagination: some years after the western Empire had converted to Christianity, the then-emperor ordered the removal of the already-ancient altar to Victory which had stood in the Roman senate for centuries. After much complaining, the senate did so. It was stored - somewhere - but after the first Gothic sack of Rome the statue of Victory and the rest of the altar disappear utterly. They've never been found. Now, if there were precious metals on the statue and altar piece, they were probably melted down. And if the elements of the sacred artifact were stone or marble, they could have just broken apart. But I IMMEDIATELY started thinking...what if they were found? I actually stopped the podcast for a while just so I could turn it over in my head. Not the kind of mystery I write, but for someone who works in the Dan Brown-style genre, what a story kernel! Oh, that is a fascinating story. The national guard can't send Clare somewhere so she can discover it? Haven't heard of Hadley before but look forward to seeing you lay out the clues in this book. What could be more perfect than a mystery book about a real-life mystery involving stolen manuscripts? One written by Sherry Harris. This mystery interests me greatly. Very intriguing and fascinating.I have read about Hadley. It's an amazing bit of history! Laughing! I should be so lucky and you are welcome! What a brilliant idea for a story line. Truth is stranger than fiction, until you combine them! Then it's a marvelous free for all! Thank you, Libby. It was fun to incorporate it into the story. I think Hadley was fed up with Ernest and lost them on purpose and then had to pretend they were stolen. Oh, I love that! She didn't want to go on the trip. I had never heard of tge missing Hemingway Manuscripts, but now that I have read all of the comments, I'm going to try to find them. Congratulations on your new book, Sherry! I can't wait to get stared on your series. Thank you, Natalie! If you read ebooks the first five are on sale. When I read Hemimgway many years ago I didn't become much of a fan, but your details make me think I should revisit. He had an interesting life! The Hemingway Thief - Shaun Harris' book from Seventh Street - also fictionalizes this event. It's such a fascinating story, it's worthy of attention from multiple angles. I have put off reading it since I didn't want his story in my head. We met for the first time in at elevator at Bouchercon in St. Petersberg and talked about our different takes on the story and our very similar names. I didn't even catch the name similarity. Spooky! I never heard the story about the missing manuscript. I think they were put into the trash. I am excited to read this next book. Also Ernest Hemingway. I think that is the most likely scenario. I hope you enjoy The Gun Also Rises! Sherry, I'd read both A MOVEABLE FEAST and THE PARIS WIFE and was fascinated by the idea of the lost manuscripts--which you've used brilliantly!! Can't wait to read your take on this!! Congrats on the book, it sounds terrific! Thank you! It was fun to incorporate that story in my book. Oh, the librarian in me loves a mystery set around the stolen manuscript angle - brilliant! Can't wait to read this, Sherry! Congrats on your release! Thank you, Jenn! I loved writing it. This should be fun o read. Sherry, the book sounds wonderful!! I can't wait to read it. Yes, I'm familiar with the story. But I also had something similar happen to me. After a weekend retreat, I parked my car - my parents' actually - in the East Village. Someone broke into the trunk and stole a bag that held the second act of a play I was writing. This was before computers. I was devastated. I spent a week in the Village talking to homeless people, the Hell's Angels - they had a crash pad in the East Village back then, anyone I thought might help. It was never found. I also lost a beautiful counted cross stitch pillow I was making and a personal letter from Harry Caudill, famed Eastern Kentucky author of Night Comes to the Cumberlands and other books about the region, which was where my play was set. Oh, Ellen! What a loss! Did you ever finish the play? We took the train to Philly this weekend and I watched our suitcases like a hawk. First of all, I love this book cover! What a great story and news to me! I like your version of what happened! Thank you. I love the cover of this one too. It's the first that has been an inside scene. I had heard the story and always wondered about whether a marriage--that marriage--could recover from that event. I know some marriages could, but even as a young person I doubted that Ernest Hemingway would forgive his wife for losing that manuscript. As a high schooler, I compared that reaction to how I instinctively knew my grandfather would have felt about any mistake my grandmother would have made, as young marrieds or when they were celebrating their 50th anniversary. When it came time to get serious about choosing a partner, I had a template in my grandfather of what to look for; over the years I've learned that sharing a life with someone who knows how to forgive is essential. Poor Hadley. What a lovely story, Beth! Thank you for sharing it! What a great story I can’t wait to read it. What an intriguing book ! I can't wait to read it. Thank you for the contest.